The Driver's Seat offers a wide variety of tonneau covers. Everything from roll-up vinyl to electric retractable hard shell. Which tonneau cover is best for you? 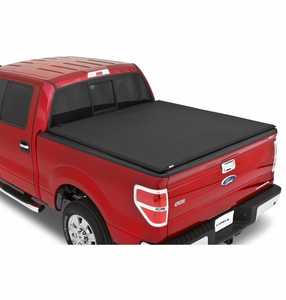 Choosing the right tonneau cover all depends on how much you use the bed and how secure your cargo needs to be. If you use the bed a lot, you're on a budget and security isn't too important, then the roll-up vinyl covers from Truxedo are a great choice. If security is an issue, you have tri-fold tonneaus from Bak Ind., plastic hard shell tonneaus from Undercover and retractable metal bed covers from RollNLock & Pace Edwards to choose from. Which ever you choose, we've got you covered with the best products at the best prices. Installation also available. See salesperson for prices and details.